A hire van containing the majority of Iggy Pop & The Stooges' live equipment was stolen from outside the band's Montreal hotel between 6:30 and 7:30am local time on 4 August. 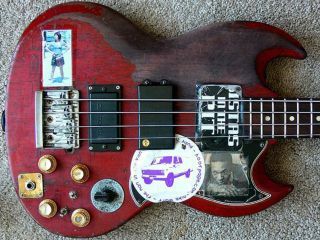 Among the missing items are Mike Watt's 1963 Gibson EB-3 bass (pictured), two of Ron Asheton's Reverend electric guitars, two Marshall Vintage Modern amplifiers, four Marshall 4x12 cabinets, an Eden bass backline, a silver sparkle Gretsch drum kit and a number of pedals and microphones. Click here to see the full inventory of stolen items. The van - a Penske 15-foot yellow truck, US license AC46493 - was parked outside the Embassy Suites Hotel, at 208 Saint Antoine Ouest, Montreal, Quebec, Canada. If anyone has any information regarding the crime they are urged to contact Eric Fischer via nycentral13@gmail.com as soon as possible. Pictures of the stolen items can be seen here.